k-space is an array of numbers representing spatial frequencies in the MR image. The common pictorial representation of k-space as a "galaxy" perpetuates the mystery. Each "star" in k-space is just a data point derived directly from the MR signal. The brightness of each star represents the relative contribution of that star's unique spatial frequency to the final image. K-space is the Fourier transform of the MR image. Although the k-space "galaxy" and MR image appear quite different, they contain identical information about the scanned object. The two representations may be converted to one another using an advanced mathematical procedure (the Fourier Transform). The cells of k-space are commonly displayed on rectangular grid with principal axes kx and ky. The kx and ky axes of k-space correspond to the horizontal (x-) and vertical (y-) axes of the image. The k-axes, however, represent spatial frequencies in the x- and y-directions rather than positions. The individual points (kx,ky) in k-space do not correspond one-to-one with individual pixels (x,y) in the image. Each k-space point contains spatial frequency and phase information about every pixel in the final image. Conversely, each pixel in the image maps to every point in k-space. 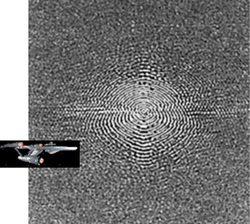 The k-space representation of the MR image is therefore akin to the diffraction patterns generated by x‑ray crystallography, optics, or holography. X-ray crystallography pattern of DNA. This is actually a k-space representation of the molecule's helical structure. Each point in k-space maps to every point in the image, and vice-versa. This is a simplified introduction. Please see the "Advanced Discussion" below as well as other Q&A's in this section for further explanation. The concept of k-space is admittedly abstract and difficult to visualize. Over the years I have tried many different approaches for my students (with varying degrees of success). Below is an analogy using lenses that many have found helpful. Consider viewing the famous sculpture of Queen Nefertiti through a pair of lenses. Light waves reflected off the sculpture enter the first lens and are refracted (bent) as a function of their spatial frequencies. Lower frequency waves are only weakly refracted, passing straight through the center of the lens. Higher frequency waves are refracted more at the edges. The "output" of the first lens is a series of unfocused wave fronts with higher spatial frequencies toward the periphery and lower frequencies toward the center. These waves constructively and destructively interfere. The first lens has thus performed an "optical" Fourier transformation of the incident light rays. If you put your head midway between the two lenses (at the so-called Fourier plane) and looked back towards the Queen, you would see nothing except a vague diffuse glow representing the average intensity of light entering the first lens. The light waves are unfocused and would not form a picture on your retina. You are in "optical" k-space. The second lens reverses this procedure, reassembling the waves dispersed in optical k-space back to their original relationships. The second lens thus performs in inverse Fourier transformation, allowing the creation of a focused image. Why don't you see an image of the k-space "galaxy" when you put your eye at the Fourier plane? One reason is that the eye is sensitive only to magnitude, while a lens mixes both phase and magnitude information together. To actually detect the predicted optical k-space pattern, a more sophisticated device is needed, called a "4-f" apparatus. The 4-f setup includes a highly collimated monochromatic laser light source, a filter or screen placed at the Fourier plane, and detection with a sensitive charge-coupled device. Such 4-f experiments are often demonstrated in graduate-level physics or engineering courses in optics and can be purchased from scientific educational supply houses. Even if the Queen Nefertiti example didn't help you, the take-home point is this: k-space is a deconstructed representation of spatial frequencies inherent in the original object. For light waves the transformation from an object into optical k-space occurs simply and instantaneously with a lens. For MRI the process is more complicated and time-consuming, involving signal collection after stimulating the object with multiple RF-pulses and variable gradients. But the result is the same: production of an array of k-space data geographically organized by spatial frequency. In both optics and MRI, a reversal of this process then takes place, with reassembly of dispersed waves into a coherent final image. Brown TR, Kincaid BM, Ugurbil K. NMR chemical shift imaging in three dimensions. Proc Natl Acad Sci USA 1982; 79:3523-6. Ek L, Thaning A. Fourier optics. KTH Royal Institute of Technology, 2012. Ljunggren S. A simple graphical representation of Fourier-based imaging methods. J Magn Reson 1983;54:338-343. Mezrich R. A perspective on k-space. Radiology 1995; 195: 297-315. [review]. Twieg DB. The k-trajectory formulation of the NMR imaging process with applications in analysis and synthesis of imaging methods. Med Phys 1983; 10: 610-621. If the points in k-space don't correspond to points in the image, what do they mean? Where do you get the data to fill k-space? How does this relate to MR signals and echoes?